The 72’’ – 76’’ Oval Rectangle Table Winter Cover by Protective Covers Incorporated is a single cover that is suited to protect a single outdoor table. The large outdoor table may be oval or rectangular in shape and measure between 72’’ and 76’’. If you need a covering for sets of dining furniture that include chairs, locate other choices of PCI coverings that are suited for dining sets. 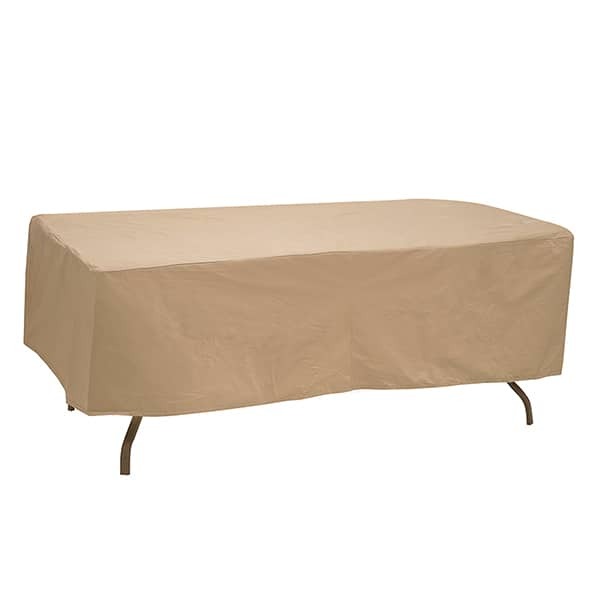 The 72’’ – 76’’ Oval Rectangle Table Winter Cover is made to protect your outdoor dining table during the off-season so that when you bring it out from storage, there are no surprises. The PCI brand uses a trademark exclusive protective coloring prototype called Dura-Gard HD Vinyl. PCI aims to make protective coverings that perform better than regular fuzzy backed vinyl coverings. The difference lies in the backing, which features a soft and protective material that doesn’t flake and degrade like typical fuzzy fleece. It’s made with polypropylene that is compressed and then laminated onto the protective fronting. You will see the difference!